The HardieDeck™ calculator will help you with an estimated "materials only" price for the HardieDeck™ system (excluding the deck frame, bearers, joists and installation). 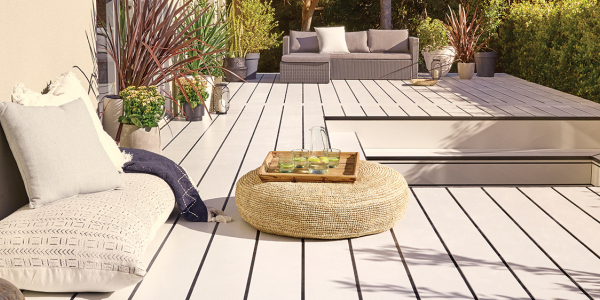 You will receive a list containing your deck size, perimeter length and edge option. Please email this to yourself for your reference to discuss with your local HardieDeck™ retailer for a detailed and confirmed quotation, which includes all required HardieDeck™ components, relevant for your location. Please submit your email address to get your HardieDeck quote. If the shape of your deck is more complicated than a simple box shape break it down into boxes by adding additional sections. See an example. Measure the perimeter to determine the length of edge capping required. Edge caps are used on the sides of the deck which are not butting against a building. See an example. They secure the perimeter boards in place and keep the fixings hidden. If you decide to not to use an edge cap, the edge boards will require face fixing. Note this is not a calculation, just a record for your print out. Your estimation has been sent! Want to find a HardieDeck distributor near you?